The Chicago Tribune recently proclaimed Greg Schwem, “King of the hill in the growing world of corporate comedy." His humorous take on the 21st century workplace and work/life balance has landed him on SIRIUS Radio, FOX News, the Huffington Post and the pages of Parade Magazine, along with opening concert slots for headliners including Celine Dion and Jay Leno. More than just a business humorist, Greg is also an author, award winning greeting card writer and nationally syndicated humor columnist, recognized by his peers from the National Society of Newspaper Columnists for outstanding humor writing in 2014. But Greg is first and foremost a corporate entertainer. Kyle Davis: Hi. With us today on GDA podcast we have Greg Schwinn. He is a corporate humorist, business comedian, whatever else, ipso facto thingamajigger name we're going to throw in there, we can do that. [00:01:00] You probably know that I don't like doing intros, so Greg, take it away. Greg Schwinn: Thank you, Kyle. That was actually a very good intro. Kyle Davis: Yeah, I know. Greg Schwinn: Probably the first one that included the word "thingamajigger." Kyle Davis: Yeah, I think that's a scientific word, right? Greg Schwinn: Yeah, but you got it right. I am a business humorist, which means I go around the country and I make the corporate world laugh. That's what I've been doing for the past 15 years exclusively. Kyle Davis: One of the things we were talking about prior [00:01:30] to going to record ... I want to get into your background in a moment. How important is it that people in the corporate world laugh? How important is that for you? Greg Schwinn: I think ... I don't want to say that it's necessary. I want to say that it's vital, because it is. I think that everybody now is very immersed in their work. You have to be. [00:02:00] We live in a very competitive environment now. I think everybody needs a break. They need to laugh at themselves, they need to laugh at their work environment. They need to stop and say, there's a lot of humor around me, even at my desk, or in my office, or among my colleagues. THat's what I try to provide. It's interesting, a lot of times when I'm being pitched for jobs, I'll have clients say to me, they'll say one of two things, both of which really [00:02:30] puzzle me. One is, "We're not a fun company." Which I don't understand, because the company is made up of the employees, and you have fun employees. Greg Schwinn: "We're not a fun company, we're not a fun organization. What we do is not fun." And I would say, "It doesn't have to be, and let me decide that. Let me tell your audience that it is fun." And the other one that I get sometimes, [00:03:00] which people say, is, "It's not a good time for us to be laughing right now." That one, I really don't understand, because to me, it's always a good time to be laughing. I know that sounds like a total sales pitch, but one thing that I firmly believe is that the great thing about laughter, and particularly laughter at corporate events, is it works anytime. When times are good, companies want to laugh, and when times are bad, companies need to laugh. That is really what has kept my business [00:03:30] on the upslope for 15 years, is that philosophy. Kyle Davis: I find it fascinating that companies take themselves so seriously, that they go, "This is not a time for us to laugh." Greg Schwinn: Ha, ha, ha. Greg Schwinn: It is ridiculous. What can I say? If that's what they say, then I say, "Maybe you need to have a more serious speaker." Obviously, the serious speakers that give a lot of information [00:04:00] are certainly needed at events. It can't be all silly-silly. But I am a big believer that everybody needs a break, and they need to just step back a little bit and smile at their world. That's where I come in. Kyle Davis: Very cool. Before this, you had a previous life. Greg Schwinn: Yeah! My background. I went to Northwestern University, and I was a journal ... I studied journalism, and I actually used [00:04:30] my journalism degree, believe it or not. I was a newspaper reporter and then a TV reporter, down in West Palm Beach, Florida. I don't know if you can tell by the voice that I was a broadcast journalist, but I did that. Kyle Davis: I did have a question, actually. I have a question for you. Kyle Davis: With the voice. Kyle Davis: Is that a legitimate ... Do they train people how to do that? Greg Schwinn: No. You can train to make your voice better, but I think you either have a natural broadcast voice, or [00:05:00] you don't. Kyle Davis: It's like an on/off switch. You probably just have a normal voice and then you have broadcast voice. Greg Schwinn: No, I don't think I do. Kyle Davis: Ha, ha, ha. Greg Schwinn: But I know some people do. I have a good friend who's an anchorman in Washington, D.C. Yeah, that description just fit him to a "T."
Kyle Davis: Ha, ha, ha. You can tell me who it is later. Greg Schwinn: But I also believe there are country western singers that have a southern accent only when they're singing. Kyle Davis: This is true as well. Greg Schwinn: Or vice versa. Anyway, my background's in broadcast journalism, but I always did stand up. It was a hobby. It started in high school. [00:05:30] I did it in high school, I did it in college. I did it in Florida when I didn't know anybody. I just went to comedy clubs. That was in the mid-eighties, when comedy was, not to date myself, but when comedy clubs were really taking off. It kind of became my second job. Towards the end of the 1980s, I got a little bit disillusioned with journalism. I didn't like the kind of stories I was reporting on. [00:06:00] I liked making people laugh better, and I decided, it's now or never. I was single. I didn't want to look back and say, "I wish I'd tried this." I quit, I moved back to my hometown of Chicago, where there were a lot of clubs. I became a club comedian. and I did that for about three years. I was your typical, when you hear of a club, a road comic. That's what I was. I drove around the country working comedy clubs, which was great experience. About five years into that, I started doing [00:06:30] a lot of material in my club act about computers, and learning to operate one, because the technology age, that was the dawn of it, really, the mid '90s. I would have people come up to me after my shows and say, "Wow, I really wish you'd come down to my office and tell those jokes, 'cause that is exactly what we're going through." I would get bookings. People would literally book me after a club show. They would give me their card, they would say, "Call me Monday, this is when we're having this event." I would go there and I would [00:07:00] do this. It was a totally new world for me, because I'd never ... Having never worked in the corporate world, I didn't know that corporate meetings existed. I didn't know that there were these off-site training meetings, and three-day conferences, and things like that. Then I got hooked up with a corporate agent, who booked me. The bookings got a little more fancy. The first one I did, it was for Hewlett-Packard. It was down in Orlando at the Dolphin Hotel. [00:07:30] I had to do about 20 minutes. I remember standing on stage in front of about 700 Hewlett-Packard executives and their customers, and as I was doing the show, it was almost like an out-of-body experience for me. I remember thinking, "This is the nicest stage I've ever been on. This is the nicest hotel I've ever stayed in. And these are the nicest, most appreciative people, in terms of what I'm talking about." I was making jokes, good-natured [00:08:00] jokes, like I still do, about Hewlett-Packard, about their organization, about some of the products that they were introducing. From the CEO ... Not the CEO, he wasn't in the audience, but the VP of marketing, top dogs were coming up to me afterwards and saying, "Man, did we need that. You so nailed it." That was all I needed. A whole new world opened up for me. I just transitioned my performance away from being a nightclub comedian to becoming [00:08:30] a business humorist, which is what I call myself now. Greg Schwinn: Yeah. I think so, now. We live in a very, I don't want to say a toxic environment. Comedy ... It's kind of a catch-22. Comedy is very hot right now, in terms of, we're always wondering what the [00:09:00] late night hosts say about politics and so forth. They have millions of YouTube hits the next morning. That's great. Yet, at the same time, we're living in a world where, "This comedian said that, and we found that offensive, and he shouldn't have brought that up." That's why the word "comedians," sometimes gets that negative rap. I'm not that kind of comedian. I never have been. [00:09:30] I firmly believe that people want to be entertained. This was even when I was doing my club act. I don't think people want to be preached to. I don't think people want to listen to foul language. I just believe they want to be entertained. When I'm onstage doing business humor presentations, that's my number one goal. It's to entertain people, without the language, without the topics [00:10:00] that can be taboo or that will cause HR to start sweating. Greg Schwinn: In the audience I always know where they are, they're usually sitting in the front row. Ha, ha, ha. With a watch. Greg Schwinn: [inaudible 00:10:16] Under 45 minutes, everybody's still happy. Kyle Davis: Yeah. That's funny. Greg Schwinn: That's always the MO that I've adapted. Kyle Davis: That's good. I'm going to pick on my mom for a hot second, [00:10:30] because she's not on this with us. For Christmas this year, she thought it'd be a great outing to send the entire office to go see Office Christmas Party. Greg Schwinn: Oh no. Ha, ha, ha. Kyle Davis: If we'd had an HR team, they wouldn't have loved it. Kyle Davis: So I thought that ... Sorry, I'll edit that out, maybe. Kyle Davis: You mentioned that when you were talking to HP and you were giving them their performance, and that was kind of the moment [00:11:00] you decided to pivot more into this corporate setting. Kyle Davis: That they really liked what it was you had to say, and everything else. Kyle Davis: I know that this is something we talked about, but how important is the shock factor of actually coming in prepared and knowing what you're talking about for that specific client, and really leaving them going, "Oh, man, he customized it for us." Greg Schwinn: Right. It's vital. You know what, I really, Kyle, I don't think I could do what I do [00:11:30] if not for the internet. I could ... If the internet didn't exist, sure, I could have a conference call with clients, and I could say, "Tell me a little about your organization." I still do that. That's one of the things that comes with hiring me, is a conference call. But the internet, it makes it so easy to just drill down, find out what you do, find out what products they're pushing. The wealth of information that I get. I know exactly [00:12:00] where I want to look. I look at press releases. I look at ... I'll watch YouTube videos. The fact that if you're at all skilled in PowerPoint or KeyNote, which I do include in my presentation, that you can grab images right off their websites, and I include that in the presentation. It makes it more real. I think the audiences are incredibly appreciative when someone comes out, and within the first couple [00:12:30] of minutes, they know the speaker has researched them. This is not a canned presentation. I think at corporate events, a lot of people sit in the audience, and they watch a speaker, and the speaker is very ... He doesn't stumble. It kind of looks like maybe he's done this about a hundred times. I want to be prepared, obviously, but I don't want to give that feeling. I want to make it ... Every show is different with me, and it's different because [00:13:00] every audience, every company is different, and therefore I'm gonna have different material about them. That's the whole point of customization. I do think people love to laugh at themselves. They love to laugh at generic topics, but I really do believe, if it's done correctly, and it's done not mean-spirited. I always tell companies, there's a very fine line, and a lot of comedians who work corporate events don't realize this, there's a very fine line between having [00:13:30] fun with an audience and mocking them. You mock people, they're going to turn on you. Greg Schwinn: I don't think, I know, that I'm very good at not crossing that line. My audience is people, I can poke fun at what they do, but this is their life's work. It's their passion. It does me absolutely no good to go in there and belittle what they do. It's not something I want to do, and it would be stupid on my part. Kyle Davis: These giant tech companies, they hold this annual event where it's like their version of the Academy Awards, or whatever. Kyle Davis: It's like, "Best YouTube video." Or "who's making that one product that's disrupting?" Or some jargon like that. Greg Schwinn: Okay, so not destroyed, like, "I was so funny I destroyed the audience." Kyle Davis: No, he, I thought it was funny. Kyle Davis: It's kind of what you're saying, there is this fine line, but then some people are like, "No, I'm going to definitely cross it intentionally." Kyle Davis: And do it very blatantly. Kyle Davis: I think there's some truth to it. There's a big difference between having a laugh with someone versus having a laugh at someone's expense. Greg Schwinn: Yeah. A lot of companies have been very ... Companies can take a joke. I remember, I did a bunch of shows for McDonald's several [00:15:30] years ago. McDonald's, at the time, had had a humongous product launch that turned into a flop, and that was their, it was a breakfast sandwich, it was called the flatbread something or other. Huge marketing campaign, and it just didn't sell. They knew it. When I came in, and we were having that conversation, they basically said to me, "A couple of jokes about the flatbread is fine. [00:16:00] Don't push it. Don't do ten minutes." I think I maybe had prepared one. And that was it. Basically, the message there said, "We can take a joke, we can laugh at ourselves, but don't belabor the fact, otherwise that's going to annoy us." I think most companies had that philosophy. It's fine to laugh at ourselves, but when you start to get a little personal, [00:16:30] then it's time to, then all of the sudden it's not funny anymore. Kyle Davis: Press releases online, and everything else, what's the biggest, or one of the best reactions that you can tell us about from an audience, where you're like, "Oh yeah, nailed it." Greg Schwinn: Ha, ha, ha. I always like to look at their social media. [00:17:00] A lot of times, I'll just point out things that they might not have realized around their social media. I'll do it in a very fun way, but a lot of times, for example, companies, this always gets a big laugh. Companies will maybe tout their meeting. They'll set up a Facebook page, or they'll keep plugging it on Facebook. You can say ... Usually you can click, " [00:17:30] will attend," "not sure," "can't go," one of those three. People don't do that. They just don't. If an audience, they might have a thousand attendees, and if you go to their Facebook page, maybe four people clicked, "I'll be attending." I'll put that up on the screen, and I'll say something like, "Wow, I'm so glad that this meeting is so well-attended. I was a little worried, [00:18:00] because I was on your Facebook page, and as of three days ago, click, only four people were coming." That always gets a big laugh, except from maybe the marketing team. It's that kind of thing. The way I like to construct jokes, where you're having fun with them but you're praising them at the same time. Greg Schwinn: I've said, "This is a great audience." I always tell clients, I always say, "I'm going to have some fun with you, but at the end of the day, I'm going to be your [00:18:30] biggest cheerleader." I want people to be able to walk out of that room thinking, "This is a cool company, 'cause they hired this guy. They're not afraid to laugh at themselves, they're not afraid to have fun with themselves. This is why I like doing business, or this is why I like working for this organization." Kyle Davis: I'm gonna give you credit where credit is due. When we do these podcasts, we send a little questionnaire out to the guest, and we say, "Hey, what are some things you want to talk about?" And one of the questions you have [00:19:00] here is, "What's the strangest venue?" I need to know this. Kyle Davis: And I think everybody else wants to. Greg Schwinn: Strangest venue was the ... Are you a boater, Kyle? Kyle Davis: I'm a Pisces, but no. Greg Schwinn: Okay. Ha, ha, ha. Okay, it was the interior of a catamaran. A catamaran's a sailboat, I know that. I live in Chicago. There's Lake Michigan, but not a lot [00:19:30] of water. We're not water people where I live. They told me, they said, "We've got ... It's some software engineers, and they're going to be cruising around San Diego harbor." I thought, at first, it was going to be one of those cruise boats that see, where you have dinner, and there's a stage. I've done a lot of those kind of events. Greg Schwinn: And then, after the contract was signed, they go, "No, it's a catamaran." And I think, "Catamaran, isn't that a sailboat?" And then I'm thinking, where in the heck am I going to do [00:20:00] a show on a sailboat?" As it turned out, it was about twelve of them, and they go downstairs. Down ... Again, I don't have the sailing terminology. Down below. And they literally sat in a semicircle on couches, and I did 45 minutes for them. Believe it or not, they had a good time. After a while, it was ... Obviously I couldn't bring my AV setup with me. There was no PowerPoint or KeyNote in that one. It [00:20:30] was definitely one of, probably the most interesting. Meanwhile, the sights of San Diego harbor are going past these people. It's a beautiful night, and they're downstairs. I almost felt guilty, in a way. That's probably the most interesting one. Kyle Davis: Yeah. I don't know. I like those little harbor tours that they do. They did them around New York City, and my university. Kyle Davis: My school rented [00:21:00] one of them for our graduation, and we all went on it. I just kind of get on there and I'm like, "Cool, there's dance floor, but now I want to be outside, but okay, what's inside?" Greg Schwinn: Right, right. Do I want to dance, or do I want to see the Statue of Liberty from really close? Kyle Davis: Right, and I'm like, my ADD is just going ridiculous, and this is unenjoyable, there's too many squirrels, what's going on. I can't handle it. Yeah. A catamaran event, it'd be worse. Greg Schwinn: Top that one. Kyle Davis: Top that one. [00:21:30] I can't. You win. You're welcome. You can have that one. I know that you've offered a couple books, and I know that you've hinted on one of them. If you could tell the audience the things that you've written about, and maybe any other work that you have coming up, as well. Kyle Davis: Things that you're working on. Greg Schwinn: Yeah. I'm a believer that you should always, even if you're doing ... Even though I do about 40, 50 gigs a year, I always believe you have side projects [00:22:00] going. Yes, I've authored two books. 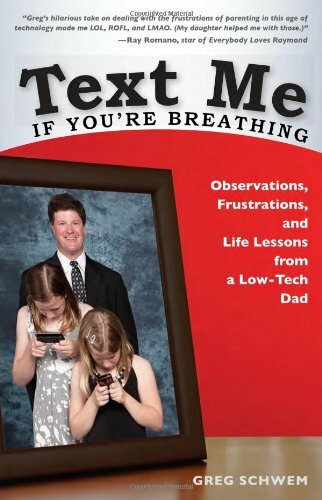 Six years ago I authored, "Text Me If You're Breathing, Observations, Frustrations and Life Lessons from a Low-Tech Dad." That was a book of short humor stories about raising your kids in a high-tech world and trying to stay one step ahead of them all the time. At the time that came out, my kids were about 11 and 6, and they were the perfect ages that we were introducing them to technology, and of course being completely clueless parents. That book almost wrote [00:22:30] itself. 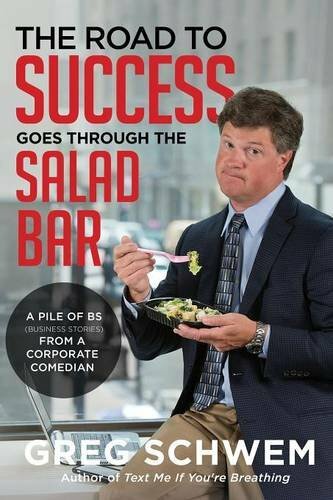 Then, a couple years ago, I wrote "The Road to Success Goes Through the Salad Bar." A pile of BS, I call, it, business stories from a corporate comedian. Those are the kind of ... A lot of that ... Those were stories about business topics that were a little too long to make it into my live presentation. A lot of chapters about the off-site business meeting, about doing an interview via Facetime or Skype. What to put on a resume these days. All very tongue in cheek. I write [00:23:00] a nationally syndicated weekly humor column for the Chicago Tribune syndicate. That's another thing I do. A lot of the material came from those columns. I'm also excited about my new project. I've created a web series, which I hope to sell. I'm in the process of trying to get a cable channel or a streaming media service interested in, and that is called, "A Comedian Walks into an Airbnb." I became very fascinated with the concept of Airbnb about a year ago, the fact that people will open their homes to strangers and let [00:23:30] them live with them, side by side. When I'm on the road doing gigs, schedule permitting, I will take an extra day, I'll stay at an Airbnb, I'll find somebody that I think is quirky. I'll vet them, and say, "I'd like to stay at your place, but you have to agree to a sit-down interview, and you have to agree to let me film it." I have met so many fun people. I do about a five-minute segment for each city I visit, and it has been more fun. [00:24:00] I have to be around people to get material. Greg Schwinn: There's a lot of comedians and humorists that don't, it sounds weird, but don't like people. I've met some. They don't want to be around people. I love people. I love to, after my shows, I love to hang with the group that I worked for. I'll go to all their cocktail parties and eat with them, so forth. I personally think that's part of the job. Greg Schwinn: I'm not doing it because it's part of the [00:24:30] job. I'm doing it because I genuinely enjoy it, and I love hearing their stories. That's why I've started doing "A Comedian Walks into an Airbnb." All the episodes are on YouTube. Kyle Davis: We'll definitely have to post an episode or two when we publish this episode of the podcast. I'm curious. You find these eccentric people. Kyle Davis: Or quirky, weird. Greg Schwinn: I don't know about ... Some have been eccentric. Most have been, I would say, quirky, entertaining. [00:25:00] I look at their profiles. Greg Schwinn: Something strikes me in their profile that's creative or something. I'm not necessarily looking for strange, offbeat properties. I want the people that rent them. Greg Schwinn: And I've stayed everywhere from ... I stayed in an Airstream trailer in the middle of a farm in Texas when I was doing a show in Dallas. I stayed ... I did a show in Vale, and I stayed in a guy's 1985 [00:25:30] Volkswagen van, which was parked on a ridge. It was just an air mattress in a van, in the middle of winter. Greg Schwinn: I've stayed in different places, but I've met so many ... And all I could think was, "Who rents out a van? Who rents out a 1985 van? I want to find this guy." And he was hysterical. He was just a millennial guy with, this was, like, one of seven ways he made money. [00:26:00] A pleasure to talk to, and a pleasure to question about how he, why he was doing this. Kyle Davis: Maybe talk about that person, or talk about somebody. I'm fascinated by this. I want to hear a story or two about the unique sights, sounds, and maybe even smells that you've come across. Greg Schwinn: Ha, ha. Yeah. They've all got their own sort of personal touches. [00:26:30] The van one was probably my favorite, as far as uniqueness. I stayed in Miami with a woman who was an ex-stripper. Favorite line of all the shows and all the interviews with hosts that I've done, favorite line came out of her mouth. "I'm a stripper who became a house flipper." Greg Schwinn: She said that, and it's one of those ... It goes back to my [00:27:00] broadcast journalism days, when you're interviewing somebody, and they say something, and you're like, "Okay. Interview's done. Got what I need." I just got the gold sound bite, right there. And this is what she did. She rented out her place, and it was right on the Intracoastal Waterway in Miami Beach. She owned a, in her previous life, prior to stripping, she owned a rock 'n' roll memorabilia store, so she had all sorts of [00:27:30] pictures on the wall of her with rock stars. Oh yeah, second favorite line, after that one, is she shows me a photo of her with Robert Plant, and she goes, "This is me with Robert Plant. No, I didn't. Yes, I would have." Greg Schwinn: Exactly. I know. I'm like, you can't write this stuff. Kyle Davis: Yeah. I love interesting stories like that. Kyle Davis: I've had buddies of mine who've done Airbnbs in unique locations, like these quirky, interesting, weird ... [00:28:00] I don't know what the ... It's all positive, I'm not saying anything wrong with Airbnb or its hosts. Greg Schwinn: Oh, yeah, yeah. And I always tell ... My philosophy with doing these episodes is the same as the philosophy that I use, that we talked about earlier, of doing my corporate shows, is that I want to make them look good. And I tell them that. [00:28:30] When we're emailing back and forth, and I agree, I say, "I want to make you guys look really good." Why would I want to go in there? You're opening up your house, or your van, or your air mattress. Kyle Davis: Or your Airstream. We live in an age, now, Kyle, where everything's on video. Where there's always a camera present. But I think people are perfectly okay with talking on camera, and not necessarily caring [00:29:30] where it ends up. Again, I don't think I could have done something like this ten years ago. I think people are very ... I don't think they're as guarded as one might think, these days. I think people are trusting, I think that's why organizations like Airbnb, like Uber, exist, because we're okay with commiserating with strangers. Kyle Davis: Mm-hmm (affirmative). I agree with that. I think, you're gonna commiserate with a stranger anyways, right? If you go into a legitimate [00:30:00] hotel, or jump in the backseat of a taxi, that's still a stranger. Greg Schwinn: Yeah! Exactly. It's just a little bit, maybe it's just a money thing. Sort of trusting my health and my well-being to somebody who's just offering me half of their house. Kyle Davis: Yeah. Here's my thought process on the whole thing. I've never done an Airbnb, but I have one planned for when I go to Austin City Limits this year. Kyle Davis: Going on, like, Craigslist. Ha, ha. Kyle Davis: Finding a room for rent and doing some shady high five where you slip the cash to somebody. Kyle Davis: That's kind of my thought. And the same thing with jumping in the backseat of a cab, I'd rather dial up my Uber, which I just learned that I have something like 2,500 rides, so thank you, Uber. [00:31:00] Versus getting in the backseat of a cab where I have a penchant for losing cell phones. Greg Schwinn: There you go. Kyle Davis: That's happened a few times. You can ask my mom about that one. There's a joke at my expense. Greg Schwinn: As did I, Kyle. It's always fun to talk about experience. I think I have a very unique job, and a very unique setting [00:31:30] that I do it in. I love talking about it, and I think people, I hope people want to listen to it. Kyle Davis: I think they do too. If they want to book you, Greg, they can do so by contacting GDA speakers at (214) 420-1999, or by going to GDAspeakers.com. For today's podcast episode transcripts. I'm going to post a couple of the YouTube videos from your new web series, "A Comedian walks in to an Airbnb" on there as well, so people can have an opportunity to look at that. All of that is available on [00:32:00] GDApodcast.com. With that being said, thanks, Greg. Greg Schwinn: Hey, my pleasure, Kyle. Thank you.